Archive | Harry Dean comes to us from an age of giants. The Racers of the 1930’s were never sure they would come home from the races alive. Drivers and mechanics had to be of iron constitution to accomplish the feats they did. Despite the fact that our culture and our economy is based on the automobile, it is hard to understand now, how excited people in the 1930’s were about car racing. Almost every town had a race track of some sort. Racing was very popular. Safety equipment more extensive than goggles did not exist. By the 1930’s car were capable of doing well in excess of100 MPH. Track surfaces were commonly oiled dirt or clay. Society was much more willing to accept death in motor racing than it is today. Think of the uproar over the death of Dale Earnhardt. Imagine this happening once or twice a week at race tracks in Southern California alone. However, I think that many of the old time racers would object to singling out how dangerous the sport was. In many ways the danger of auto racing only highlighted the glamour of being a race driver. The thrill of driving so fast, finishing, maybe winning, spurred many young men and the occasional woman into pitching the open wheeled race cars around the track. At 88, Harry is one of the last of the riding mechanics that raced before World War 2. The riding mechanic was a hold over from the early days racing when cars and tires were less reliable. In the teens, the mechanic had to hand pump oil as well as gas pressure. 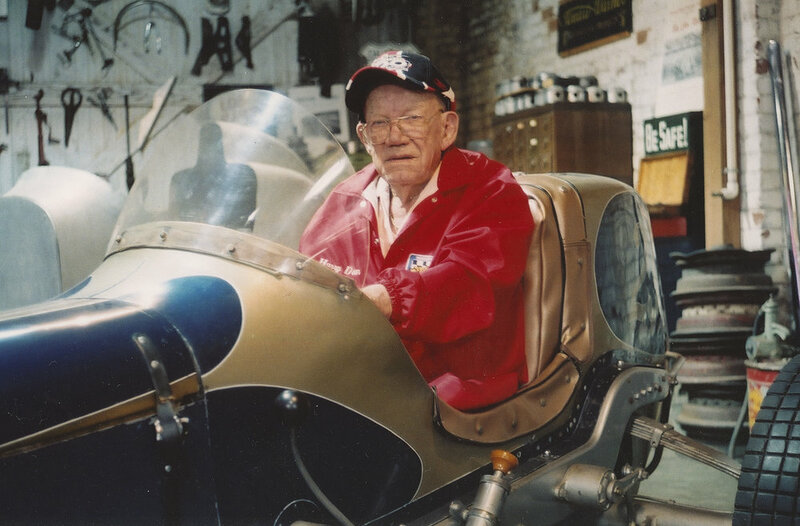 Harry was one of the few riding mechanics who was a full time mechanic. He was involved in machining parts for Miller and Offenhauser as well as building and preparing cars for races and was a regular at the rough and tumble tracks throughout the west raced at Indianapolis from 1932 until 1938. He rode as a mechanic with some of the greatest drivers in the 30’s including Rex Mays, Ted Horn and Bill Cummings. Harry’s story is tied in with the story of Legion Ascot Raceway. This landmark So Cal track was located in the fields of the San Fernando Valley near Glendale. Growing up nearby, Harry was lured to racing by the exciting events taking place at Ascot. The 20’s and the 30’s were the glory days of Miller, Duesenburg, Rajo, and Fronty Racecars. A lot of guys, including Harry, raced home brewed specials based on Fords. But the kings of the track were the beautiful and fast Miller cars. As a result of working in Millers Shop as well as working with the top racers of the day, Harry is very knowledgeable about the these race cars. Harry is also one of the nicest guys you could meet and he and his wife Buena invited me to their lovely East Sacramento home for this interview. Harry is still involved in the automotive trade. He teaches seniors safe driving skills. Harry Dean: I grew up in Highland park right over Chevy Chase Drive, where we lived on Mount Washington. That was just across the valley from Legion Ascot Speedway. And we could hear that. I went to work in a service station on Figueroa street and there was garages all around and there was race cars in all of those. So I started there, and I would go to the race track. You know, with them. I lied and cheated but I got in. Then I worked for Fred Offenhauser and Gabheart Machine shop. They were a contractor for Fred Offenhauser and Harry Miller. That's how I learned my machinist skills, making crankshafts and camshafts and all that good stuff. RustMag: So you got into racing because that’s where you grew up and you could hear the racing at Ascot? Dean: Yea, early on I went to work in the service station. You probably don’t remember the old service station Richfield had, the old towers? RustMag: Yea, I’ve seen pictures of them. Dean: Well, I went to work in one of those. Richfield and Gilmore were sponsoring the race cars, and on one two three sides of it were these garages where racers like Ernie Triplett, Swede Smith and Hal Gordon had cars in there. And I just got acquainted. I went to work for some of them and was friends of all of them. RustMag: Did you ever race? Dean: Oh well, I tried racing, but I wasn’t very good. Ted Horn and Rex Mays and I grew up together. We raced Jalopies and Roadsters at Jim Jeffries Speedway. That was on Figueroa Street. Probably downtown Los Angeles now. Do you know who Jim Jeffries was? Dean: He was a world Champion Heavy Weight Prize Fighter and he had this race track on Figueroa Street and we ran there. All my racing was before World War 2. We raced at Legion Ascot raceway. See we rode, as a riding mechanic we rode on a circuit. We raced at Indianapolis, Phoenix, Langhorn, Duquesne, Springfield, Los Angeles and Oakland. And I rode with Rex, Ted, Bill Cummings, Kelly, Joel Thorne, but mostly with Billy Cummings and Ted Horn. RustMag: When you were in a race what did you do? Did you pump up the fuel pressure and oil pressure? Dean: The oil pumped up? Who ever said you had to pump the oil pressure? That’s not true. They had a gear pump just like a modern car. We pumped the air into the gas tank to force the fuel to the carburetor and then we took the speeds, read the pit signs and looked at the tires on the rear wheels. I could put my hand out on it and if my hand started bumping it was time to change the tire. RustMag: Oh, I see, you could feel if the tire was blistered. Did you also prep the cars for a race? Dean: Oh yeah. There was a variety of mechanics. There was Otto Wolfer, Lawson Haris, Ed Kalin, Taki, myself. We worked full time. The rest of them at the races, they’d be some friend of an owner, or the friend of a driver - they’d be the riding mechanic. But there was about six or seven of us that had a full time job. We’d haul the cars around and work on em, fix em, and do all the work. RustMag: During the winter would you prep the cars and get them ready for the next season. RustMag: Did you have more than one car. Did you have your stock cars and your Miller? Dean: No. No. We had for awhilethere we had a one man car and a two man car. Some tracks we ran the one man car and some the two man with the driver and I.
RustMag: What years did you race at Indianapolis? Dean: Well, I was there from 1932 through 38. RustMag: What was your best finish? Dean: Well 3rd. But, I’ll back up. I don’t know how to say this. There has to be no names mentioned. Dean: This particular time we qualified, and this guy came over and offered me, the driver and the car owner each a hundred dollars to let his kid sit in the drivers seat and have his picture taken. So that made him the official riding mechanic. But he never rode a foot in the car. I did. We won the race that day. RustMag: Did the kid get credited with the win? Dean: yea. Before Buenaand I were married, my first wife and I went to El Centro and I was going to be the maintenance manager at the Coca Cola Factory there. It was hot and miserable and somebody told us, there is a guy up there has a Speedway Inn. I went up there, and there he was. This guy, he almost fainted when I walked in. He had a big picture up there with him as the riding mechanic. He said, “Are you gonna say anything?” I said, “No. I made a deal, and a hundred bucks is a hundred bucks. RustMag: Well, you are a man of discretion. Dean: Well, he about fainted when I walked in. He had blown that picture up to about 8 feet by 10 feet behind the bar. His dad had bought him this bar, and the last I heard his son is still running the bar in El Centro. This happened two or three times. The only official time I’m listed is when I rode with Ted Horn and we finished third. RustMag: What year was that? RustMag: Was that in a Miller? Dean: Yea, that was an 183 cubic inch 8 cylinder Miller front wheel drive. They were beautiful. They shine, everything's polished. RustMag: Were you involved in making those cars? Dean: Yea I machined a lot of that stuff. RustMag: So you were involved on both ends. You worked on it, and got to race it. If you race you’re going to be involved in some crashes. Were you ever hurt? Dean: You’ll laugh at this. If you have a computer you can punch this up. In the Indy website it tells about this. It was in ah, oh, I don’t remember. Anyway, I was riding with Ted (Horn) and it was just getting dusk and we were practicing and we were coming around out of turn four or the top turn, we called it then, and something hit me in the head, and it split my crash helmet. It was one of those good ones, you know. I looked down and all this blood and stuff was coming down and I thought it was me. But I had hit an owl. An owl hit me in the head and all this stuff was all over me. Oh, did they rib me. I thought I was hurt and Ted was laughing and I thought “what the hell is going on.” I said, “Get the Doctor!”, and they were all laughing. I looked down and there were some claws and feathers. They called me Bird man and all sorts of things. RustMag: Did the cars you raced have three speeds or four speeds? Dean: Everyone had to have reverse. Some had two and some only had one speed. RustMag: Did they start from a flying start or a standing start? Dean: We started from a flying start and they pushed with a town car to start them. They didn’t have starters on them. The 183 and the 210 had a starter and you cranked it like the old T Model Ford. RustMag: In a typical race, how many tires would you go through? Dean: Not like they do now. Maybe two or three tire changes in a race. See they change tires constantly. They use 22 tires in an Indy race now. RustMag: When you came in was it your job to jump out and change the tires? Dean: No, my first job was to turn around and hold the funnel and then they poured the fuel in from 5 gallon cans. RustMag: Were you using gas or alcohol? Dean: No. No. When they raced on the quarter milers. When they raced at Loyola and Gilmore. There was little Quarter Mile Tracks all around down south. I wasn’t that good. Well, I wasn’t heavy enough. RustMag: I would think that being heavy would be an advantage. RustMag: To get it to slide right? Dean: Yea you know they line you up four abreast and they had this rope across there and when it flew up you took off. Five laps maybe. There was, oh; many Rillo, Pewee Cullem, Sprouts, Elder, we ran at Gilmore and South gate, Layolla. In those days Midget races and Motorcycle races you could race every night of the week. Every night. RustMag: Could you make any money at it? Dean: Well, we could make twenty five or thirty bucks a night. RustMag: To show up or by winning? Dean: Oh no, you didn’t get no appearance money. Just prize money. Dean: Have you ever been to Indy? Dean: I go to Indy every year. Last year was my 88th birthday and at the Hall of Fame Banquet, they stood up and sang Happy Birthday to me, and being an old timer there, I have reservations at the Hotel. They furnish me with a golf cart. I can go any where I want. (Harry pulls out his life time pass to the Speedway) I just show that at any Indy Car race, and I can just go on in.